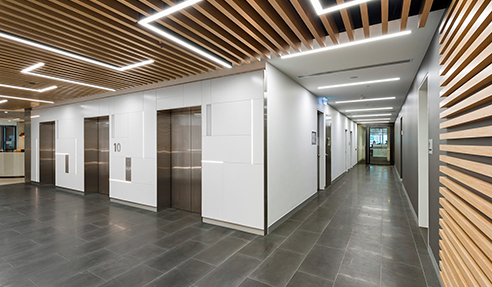 A dramatic use of MAXI BEAM with integrated lighting has been used in the lift lobbies and corridors on levels 9 and 10 of 452 Flinders Street in Melbourne VIC. INTREC Management, working alongside Architectus, focused on creating a dynamic atmosphere in the common areas to attract corporate occupancy interest for the property management client. The design involved combining batten strip lighting with heavy looking timber beams in a challenging live environment. SUPAWOOD's MAXI BEAM lightweight beams were the ideal choice to achieve the desired timber look. The beams were also easy to transport and could be cut onsite with little fuss, simplifying the entire install process. 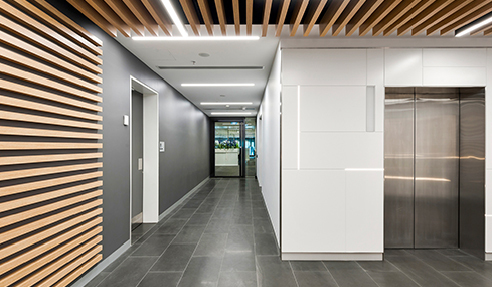 Levels 9 and 10 at 452 Flinders Street is a prestige address in Melbourne's CBD, and the retro refurbishment to the common areas was aimed at reflecting the quality of the address for future corporate tenancy. MAXI BEAM in SUPAFINISH laminate Tasmanian Oak line the ceilings of the lift lobbies on both levels, providing a stunning directional look. Batten lighting strips in the same width and depth as the 150 x 50mm beams have been placed parallel along the ceiling feature. The battens then shift across the beams in a 90° direction. Creating this effect required a lot of cutting on site, which was easy to achieve with this beam product. The end result is a striking combination of light and timber that lifts the whole area. To complete the directional effect, the wall at the end of the lobby has been lined with pre-assembled custom SUPASLAT MAXI slatted panels perfectly matched to the beams. Here, the slats run horizontally to create the effect of the ceiling wrapping over and running down the wall. This project shows how clever use of MAXI BEAM combined with partially integrated lighting can create a stylish upmarket effect to turn the most ordinary of interiors into something memorable. Find out more about MAXI BEAM dramatic lift lobby fitout by heading over www.supawood.com.au today. I would like to enquire about Supawood Architectural Lining Systems.